This idea is not original, but I’ve done it for six years and it’s one of my favorite activities because I end up with a bunch of letters I love reading and they make for a great first-day-of-class activity. 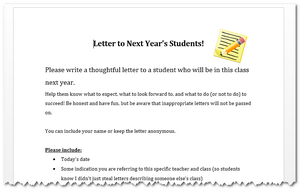 Basically it’s this: At the end of the year, have each of your students write a letter to your next year’s students. I encourage my students to put stuff that next year’s students will find helpful. It can be anonymous or they can put their name if they want. Students are motivated to do it even though it’s not part of their grade. This is the ideal profile for end-of-year activities at my school, where during the last week, final exams are a crap shoot and many (if not most) students don’t attend the last 1-2 days. I don’t use it as an academic assignment, but you very well can. I leave the task pretty loosely structured so the letters are honest and organic. I choose not to use a template or tell students what to put (but I give suggestions of topics). 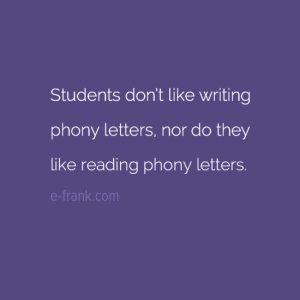 I do it this way since if a student reads the letters and they sound stuffy or formulaic, they don’t seem as genuine. Instead, the letters may come off as marketing material. I encourage students to be honest, including allowing them to include criticism if they want (as long as it’s not inappropriate, like has profanity targeted at an individual or has a bunch of penises (peni?) drawn all over it). 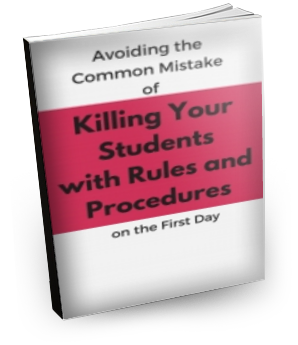 I don’t grade it or penalize the student in any way for not doing it (but if they ask if they have to do it, I ask them to please do it and that it’s helpful to me and my students for next year – sometimes students won’t do things for a grade, but they’ll do it for a purpose). I choose not to grade or penalize because this reduces the pressure to “put something good or your grade gets docked”. Again, I really want authentic letters. Almost all of my students still do it because they find the task meaningful. Occasionally a student just chooses not to do it. No problem, since I figure what kind of letter would they have written anyway if they were to do it purely for a grade? One of the things that makes this activity so meaningful is that students get to exchange “the dirt” on this class. 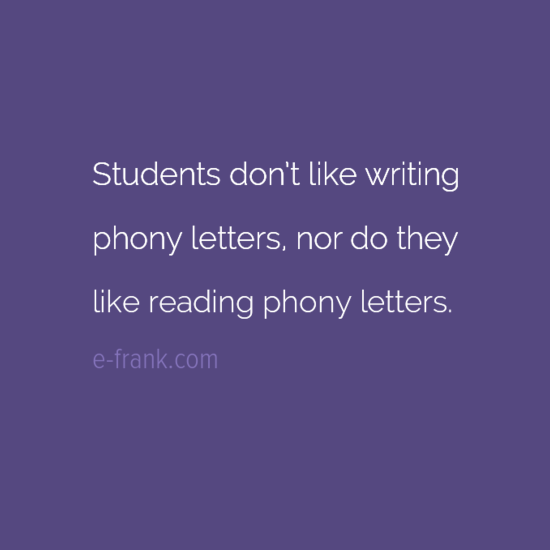 I don’t approach this as “Hey make my class look good to next year’s students!” Students don’t like writing phony letters, nor do they like reading phony letters. For the first days of class, I try to stay away from the stereotypical “rules and syllabus” lecture. Primarily, I want to address what’s usually at the front of their minds, which is “What’s this class like? Will it be fun or boring? Easy or hard? 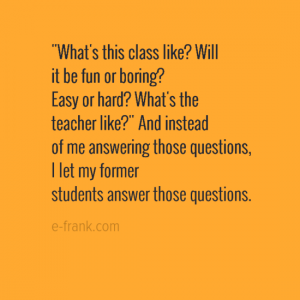 What’s the teacher like?” And instead of me answering those questions, I let my former students answer those questions. I have students in groups and I ask them to collectively write 3 things/patterns they notice about the class or 3 questions they have about the class (or mix and match). As inspiration, each student has a copy of the syllabus (more of just a formality in my class) and each group gets a pile of letters they can read and trade. They usually really dig in to the letters. Some letters say the class is boring, some say it’s fun. Some say I’m strict, some say I’m chill. The variety and honesty give students fuel for questions. Students also tend to ask questions about activities mentioned in the letters. “What’s the egg drop activity?” This allows me to segue into class expectations, what this class is about and what we’ll be doing this year, etc. Thus, some of the stereotypical “first day” stuff a teacher would normally cover is covered, but it’s at least “uncovered” through student curiosity, prompted by their own questions as opposed to force fed to them. Wouldn’t it be nice if you had all the directions for this activity already on a 1-page document so you could just print and hand your students a sheet of paper? Enter your name and e-mail below to receive the FREE student instruction sheet as a PDF and Word doc (so you can edit it as needed)!